At today’s beginning of the Seminar “Critical Thought Versus the Capitalist Hydra,” Galeano he elaborated on the support and affection of the Zapatistas for the parents of the disappeared, after listening to Bertha Nava Ramírez, mother of Julio César Ramírez Nava, who came from the state of Guerrero together with her husband Tomás Ramírez, to bring the representation of those who seek their 43 disappeared. Bertha Nava, mother of one of the youths that died that night of September 26, said that although she had in front of her the body of her son to whom she could give a burial, her pain doesn’t stop because she still hopes for the return of her son that went away to study at the Rural Raúl Isidro Burgos Teachers College. “The government didn’t have a reason to do that barbarity. If what they wanted was the Teachers College we would have given it to them with pleasure, but there was no need to do what they did, disappear our young men. We are missing 43; 43 empty chairs are in the school. Their compañeros also look for them and wait for them,” she said with tears before an equally moved crowd. “We are dying every day of our lives. While I am alive I will continue looking for them until I die. I ask you from the bottom of my heart to be with us, and that you say you are supporting us, because we don’t have anywhere else to take shelter, because the day that you leave the government will do what it wants with us,” she said looking at those with masks. “The government has already attempted it, they have sent their federal forces, their soldiers and their riot police at us to attack us but we are not afraid, because there are 43 lives at stake. If the government says that they already killed them, they owe us proof of that, she pointed out. “If in reality they already killed them then show us their bodies, because you are not going to deceive us with a few little bones. They say that they burned them, but how were they able to get so much firewood an d from where did they get the tires for burning the bodies? In that Cocula place Cocula where they say that they burned them weeds and plants are being born, if they had burned so many bodies there the grass would still impede the growth of weeds. That place is growing green again,” she indicated. “They don’t fool us. To us, the PGR is a liar because it has only delivered lies to us, pure lies,” Nava said. She said that in her life she never thought that she could come to love another person’s son, but no, now the pain has united her to all the mothers and all the fathers and they ask that they return their sons snatched. In the same way, Hilda Hernandez and Mario González, parents of César Manuel González Hernández, one of the 43 disappeared youths, spoke via a video that they sent and that was shown to the crown. Both asked for the total support of the Zapatistas to be able to continue in this struggle to see their children once again. “I didn’t understand the Zapatistas’ struggle against the bad government until this happened to us,” Hilda Hernández said, who was holding the photo of his son on her legs. The father indicated that now more than ever they require the support of all the social and political movements, like the Zapatistas in order to con front this tragedy that has now gone on for more than seven months. Because of that, Subcomandante Galeano dedicated his first words to ratify the EZLN’s support for all the Ayotzinapa parents and all those that look for their children in the whole country. “It is our struggle although small, something we have learned in all this time, to be and to accompany many other struggles,” Galeano affirmed. “And your struggle is also ours,” he told them. He said that one of the hoaxes from above is convincing those below that long struggles only wear you out and they don’t gain anything; because what terrorizes those above are the rage and anger of those below. Galeano indicated that the Zapatistas are attentive now not only to their rage, but also to the pain of the Ayotzinapa parents. And don’t worry! Your struggle doesn’t depend on the number of people in your demonstration nor that you become the theme of the moment in the social networks. “There will be people that tell you other things, they will tell you that it’s more important to be with them and that it’s more important for such and so political party or you are going to find your disappeared. You now see that there are parties that offer everything: sandwiches, buckets, backpacks, or passes to the movies,” Galeano said. He indicated that hope is the necessity with which more is gained and is trafficked up there above. 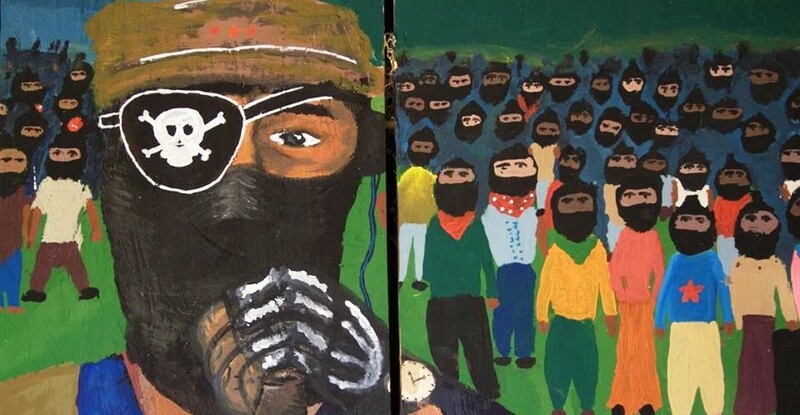 He narrated that many years ago the Zapatistas were not marching or chanting slogans, until the indigenous came out of their communities on that October 12, 1992. “The statue of the conquistador fell. A few months later, in January 1994, we went out into the cities, this time we weren’t carrying bows and arrows; we were carrying guns and bullets. We rose up in order to govern ourselves, not so that others would govern,” he added. And so, 20 years later in Zapatista land, the people govern and the government obeys. Don’t be afraid to be alone because of those who have never been with you. Don’t fear being abandoned because they only seek to use you and later forget about you,” Galeano told them.